Will you travelling with your spouse, friends or even your family but you feel confused due to boring places? Are you sure you have explored all the most popular places in Magelang? 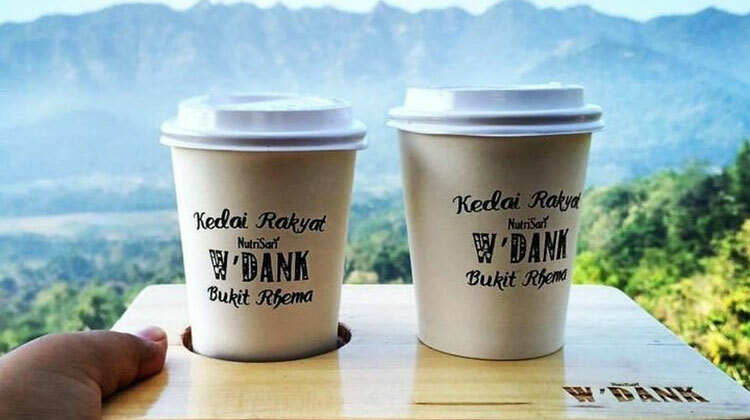 If so, you need to try the most popular place that is instagrammable to hang out with your friends while enjoying the beautiful view of Menoreh Valley at Kedai Rakyat W’Dank Bukit Rhema. Kedai Rakyat W’dank Bukit Rhema is opened in the mid of 2017 and immediately becomes the most hits culinary attraction in Magelang. In addition to its location on the hill, this place serves delicious traditional food. For those of you who have been visiting to Bukit Rhema or known as the Chicken Church, it is certainly not difficult to find the culinary location of this Kedai Rakyat. Yes, it is due the fact that the location is on the back side of the Chicken Church building. Can you imagine how cool this place? After you are exhausted enjoying every corner of Bukit Rhema which suits your selfie or wefie with your friends, you can also directly enjoy the special Fried Cassava dish because every ticket you pay to go to Bukit Rhema / Chicken Church can be exchanged with Fried Cassava; it is given with traditional sauce called Latela Gombong Cassava. The cassava served at Kedai Rakyat W’Dank Bukit Rhema is processed by local residents around the Bukit Rhema area, namely Gombong Hamlet. In addition to fried cassava that you can get for free, you can also buy a variety of hot drinks menu (wedang) and cold drinks. If you want to eat, you can order various fried foods or various angkringan (road-side food stall) menu. This dish angkringan menu is also made by residents around Bukit Rhema / Chicken chucrh. Why is this place named Kedai Rakyat W’Dank Bukit Rhema? Kedai Rakyat, in accordance with its name, in addition to the cheaper price, the menu served in this place is traditional menu that is partly supplied by surrounding residents, said Denmas, Head of Bukit Rhema. For those of you who drop by to this culinary place, it will not complete if you have not photographed your pose drinking wedang while looking at the beautiful scenery of menoreh valley. Interesting, right? After you are satisfied taking photos of drinks you ordered with some variety of angles, you can relax while enjoying the scenery around Bukit Rhema / Chicken church surrounded by several mountains, especially if you come at sunrise since the view is more interesting. Even you visit here by yourself, it is guaranteed that you will not be dissapointed! You can enjoy Magelang cuisine at Kedai Rakyat W’Dank Bukit Rhema from 06.00 – 17.00 WIB every day. As already mentioned above, Kedai Rakyat W’dank Bukit Rhema is located in the tourist destination of Bukit Rhema / Chicken Church in Gombong Hamlet, Kembanglimus, Magelang, Central Java. For those of you who do not know about Bukit Rhema, this place is a religious tour, educational tour, culinary tour, natural attractions that is popular in Magelang, especially since this place is a shooting spot of AADC2. Bukit Rhema is actually a dove-shaped building instead of chicken and also it is not merely a church. Come visit interesting Culinary Tour in Magelang and do not forget to invite your spouse or family!